! This material is based on original writing by David Wiley, which was published freely under a Creative Commons Attribution 4.0 license at http://opencontent.org/definition/ . Props to Brad Payne @ BCcampus ! Thanks to Ryerson University and eCampus Ontario! ❎ Create* ✅ Read ❎ Update* ❎ Destroy* *Requires additional configuration. controller class for each end point. Hooks, actions, and register_rest_field are fair game. Namespaced REST routes + Gutenberg = ! 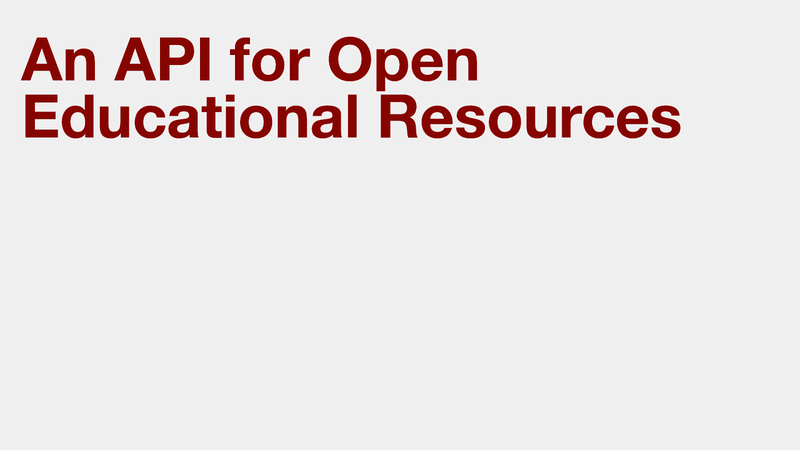 View An API for open educational resources on Notist. In spring 2017, the team at Pressbooks began work on an Open Publishing Infrastructure project with funding from Ryerson University. Our goals were to build a full-content REST API for Pressbooks and use it to power a new feature for users and institutions creating Open Educational Resources: the ability to clone openly-licensed books for reuse and remixing. We shipped this feature in September 2017 and have continued to iterate and improve upon it in the months since. Ned puts presentations on for free. You can too. An open textbook on the Rebus Community Press, made with Pressbooks. Formally adopted at the 2012 World Open Educational Resources (OER) Congress held at the UNESCO Headquarters in Paris. Material created by David Wiley, describing 5R activites of Open Content. Blog post by Pressbooks founder Hugh McGuire. Documentation for Brad Payne's Pressbooks REST API v1. API response for a book in the v1 REST API. Announcement of Pressbooks' Open Publishing Infrastructure project with Ryerson University and eCampusOntario. Documentation on extending the WordPress REST API. Human Made's PHP style guide on their engineering microsite. For use in WordPress projects with Composer. The Schema.org metadata vocabulary for books. Bibliographic extensions for Schema.org vocabulary. Documentation for the Pressbooks REST API v2 (contributions welcomed). API response for a post (Front Matter) in the v2 REST API. API response for a book's Table of Contents in the v2 REST API. API response for a book's metadata in the v2 REST API. API response for a book in the v2 REST API. Changeset on Core Trac adding the wp_blogmeta table. Changeset on Core Trac adding a /sites REST API endpoint. Wonderful presentation about API structure and future in @pressbooks from @greatislander at #WPCampus. Love when presentations/conversations utterly surprise.